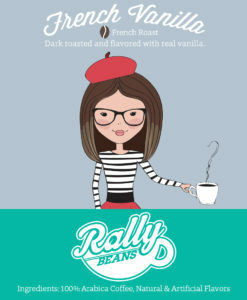 Rally Beans has added French Vanilla coffee, our first dark-roasted and flavored beans! Our flavored coffees are wildly popular. For good reason, of course – they’re crazy delicious. But there’s always been one thing missing from the flavored coffee lineup – a dark roast. Today, we fill that void. I’m all kinds of excited to announce our French Vanilla. Dark-roasted, this coffee is flavored with authentic vanilla. And just like all the Rally Beans flavored coffees, French Vanilla is a luxurious treat. And, I just have to add, how cute is that label? From the ombre hair and black-rimmed glasses to her beret and striped shirt, this gal is trendy. I just want to invite her to be my friend at book club! Rally Beans’ French Vanilla is available in the online shop (find that here), and will be a standard in the coffee fundraiser lineup. For more information about Rally Beans fundraisers, email us at info@rallybeans.com today.